﻿ Magnetic antiskyrmions above room temperature in tetragonal Heusler materials. Magnetic skyrmions are topologically stable, vortex-like objects surrounded by chiral boundaries that separate a region of reversed magnetization from the surrounding magnetized material. They are closely related to nanoscopic chiral magnetic domain walls, which could be used as memory and logic elements for conventional and neuromorphic computing applications that go beyond Moore’s law. Of particular interest is ‘racetrack memory’, which is composed of vertical magnetic nanowires, each accommodating of the order of 100 domain walls, and that shows promise as a solid state, non-volatile memory with exceptional capacity and performance. Its performance is derived from the very high speeds (up to one kilometre per second) at which chiral domain walls can be moved with nanosecond current pulses in synthetic antiferromagnet racetracks. Because skyrmions are essentially composed of a pair of chiral domain walls closed in on themselves, but are, in principle, more stable to perturbations than the component domain walls themselves, they are attractive for use in spintronic applications, notably racetrack memory. 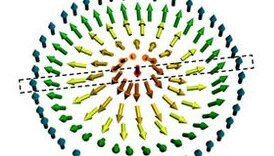 Stabilization of skyrmions has generally been achieved in systems with broken inversion symmetry, in which the asymmetric Dzyaloshinskii–Moriya interaction modifies the uniform magnetic state to a swirling state. Depending on the crystal symmetry, two distinct types of skyrmions have been observed experimentally, namely, Bloch and Néel skyrmions. Here we present the experimental manifestation of another type of skyrmion—the magnetic antiskyrmion—in acentric tetragonal Heusler compounds with D2d crystal symmetry. Antiskyrmions are characterized by boundary walls that have alternating Bloch and Néel type as one traces around the boundary. A spiral magnetic ground-state, which propagates in the tetragonal basal plane, is transformed into an antiskyrmion lattice state under magnetic fields applied along the tetragonal axis over a wide range of temperatures. Direct imaging by Lorentz transmission electron microscopy shows field-stabilized antiskyrmion lattices and isolated antiskyrmions from 100 kelvin to well beyond room temperature, and zero-field metastable antiskyrmions at low temperatures. These results enlarge the family of magnetic skyrmions and pave the way to the engineering of complex bespoke designed skyrmionic structures.